At the end of most of our walks at Howarth Park, after Chloe has been forced to sit quietly while I draw at intervals along the way, we stop at one of two spots where ground squirrels hang out. This one is my favorite. They dance along the rocks and, on sunny days, will stare at us while we stare at them. Chloe sits entranced whether they're visible or not. Even when I see no sign of them, Chloe's nose waving wildly back and forth tell me that they're around. The day I drew this it was just beginning to rain and the light was flat and gray. You can see the one ground squirrel, barely, on the highest rock, but she was gone quickly. 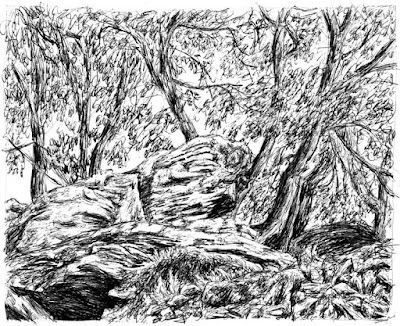 Without the squirrels to distract me, I saw the rocks differently and admired the way the tree's exposed roots wound down the hill every which way. I had to rush to finish and didn't like the sketch and mostly forgot about it until a couple of days ago when I went back and tinkered with it to try to capture the mood of that day. Unsuccessfully. Today I dove in once more and think I got it. 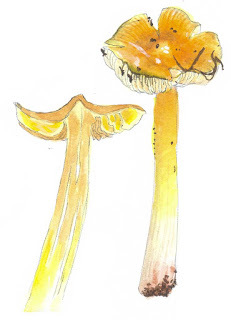 I've been trying to draw some Jack O'Lanterns (Omphalotus olivascens) for a week or so but it rained one day, then it was cold, I wasn't in the mood. 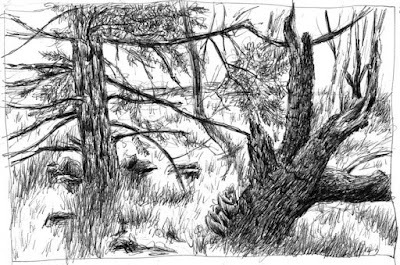 On Christmas Day I waited until the sun had warmed things up a bit and went over to Howarth Park to do some sketching. The midday light lit the meadow leading into the dell where they're fruiting and I was utterly entranced by the silhouetted trees and the shadows they cast. I kept moving farther back to try to capture it and by the time I'd found a sweet spot, the mushrooms were relegated to the chorus while the trees sang their duet. These little mushrooms are sprouting in armies all over Howarth Park. If there are trees they're there. I've seen them in grassland, as well. If you walk off the path you're forced to step on some! If you pick one and sniff it smells like bleach, which makes identification a bit more likely than if there was no smell. They're fruiting on the ground, not on wood, so that narrows it down even further. Santa Rosa Rural Cemetery was full of mushrooms today. I collected several to take home and sketch in my nice warm studio and was on my way out, trying not to look too carefully, so as not to find any more mushrooms that I HAD to take home, when I came upon a beautiful but dead Townsend's Warbler (Dendroica townsendi). I couldn't pass up an opportunity to sketch this lovely creature so when I got home I put all of the mushrooms in the refrigerator and set to work on the bird. Birds are much harder to draw than mushrooms! I managed to get one okay sketch after several that weren't even close to okay and decided to put the warbler in the freezer with the Junco from earlier this fall so that I can spend some time with both later, when I hope to be a bit more comfortable with watercolor. An oak-loving mushroom that I'm finding a lot of this season, mostly under coast live oak (Quercus agrifolia). Another Cortinarius. Most of the corts I've run across, so far, are big hulking mushrooms, with thick, stubby stems, that hide under the leaves and forest debris. I usually find one by tripping over it or by a telltale lump on the forest floor. This brightly colored mushroom had pushed right through the duff and seemed to glow on a gray day. I could see it from quite a distance. I was lucky enough to find this Cortinarius before the spores turned the gills brown. Finding this intoxicating color under layers of decaying leaves and dirt and a rather plainly colored cap never fails to take my breath away. 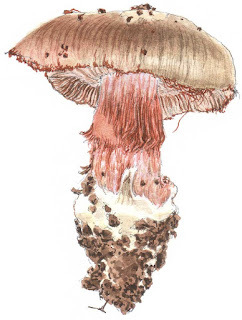 Painting a drab, slimy, brown mushroom was kind of challenging. The slime dried up before I really got to it. I probably could have spritzed it and gotten some reconstituted slime but decided the debris stuck to the cap would be just as good. Once I was done painting, there was more fun to be had. Well, actually, I had to taste the (mildly spicy) cap and gills first, then it was fun. See the smoky smudging on the stem? That's what a graying Russula looks like. When I cut into the stem, it instantly turned bright red (upper right). Ten minutes later it was smoky gray. When I dissected the mushroom, the flesh looked like it was getting an instant sunburn (1). As I painted it began to turn light gray (2) and finally, dark gray (3). How cool is that?! Because of these color changes it might be R. densifolia. 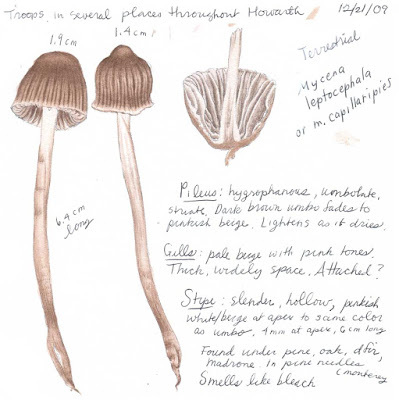 I couldn't get any spore print so will have to leave it at that, for now. The Russulas are here! The Russulas are here! 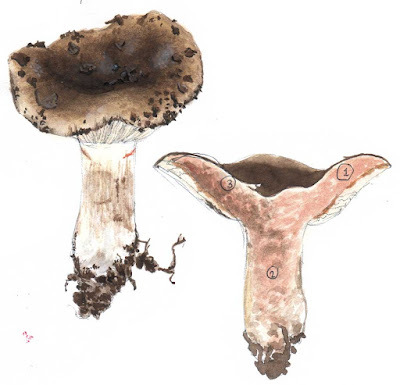 tasting the cap and gills which kind of grosses me out, but if it's mild tasting you have one group of Russulas and if it's peppery or acrid you have another. Some of them smell good, and some smell bad. Some of them turn black when bruised. Or gray. Or red. Or red then gray. Or red then black. Yikes! It's enough to make a mushroom hunter's head go spinning! 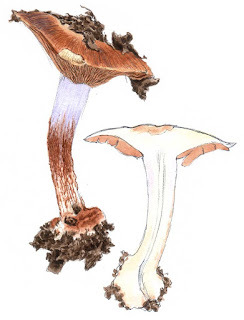 The pretty pink Russulas in the picture on top are Russula maculata. They didn't have any noticeable smell and tasted mild. Their spores were a pretty buff orange color. I don't know what the dark red one is. It might be R. xerampelina or R. placita. Whatever it is, it's awfully pretty. Even though this mushroom is supposed to be quite common, I'd never seen it before, so when I spotted it tucked away in the woods I felt as though I'd found treasure. Tricholomopsis rutilans is it's official name, but it's commonly called Plums and Custard because of the creamy yellow gills and the plum colored scales on the cap and stem. This one had no scales on the stem, probably because it was an older mushroom. I was pleasantly surprised to see the white flesh of the stem and cap turn bright yellow around the edges when I cut it. I've found no mention of that in online descriptions. If I'd found this Cortinarius sp. 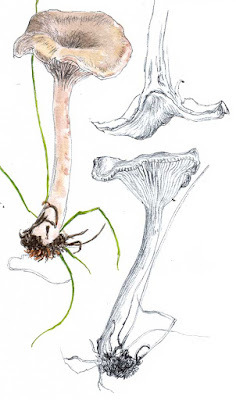 earlier in it's short lifespan, the gills and, probably, the cap would have been lavender like the upper stalk. Alas, it's glory days are over and, yet, it's still very attractive. 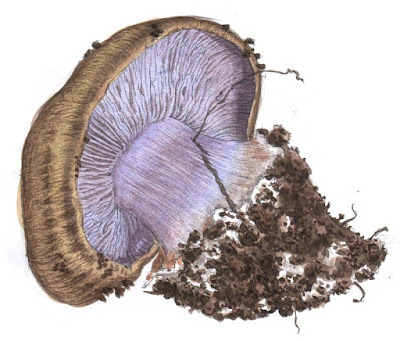 Many Cortinarius are notoriously hard to identify to species. This one is no exception and I'm no expert. Do you know it's name? I'd love to hear from you if you do. This brightly colored mushroom, Hygrocybe persistens, is one of my very favorites, partly because it's the one that got me to notice that there were mushrooms everywhere in the forest during the fall and winter. I still can't imagine how it was that I never saw these, in all of my years of walking in the woods. They're fairly common and have some relatives that are also brightly colored and easily found...if you're looking. These mushrooms are viscid, or slimy. If it's rainy and wet, pulling one out of the earth can be a real challenge! 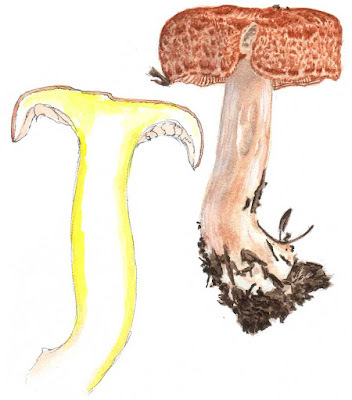 By the way, the Cortinarius would have been viscid, too, when it first emerged. Debris stuck to the cap is usually a clue, even if the slime is dried up. This mushroom is littering the woods and trail of Howarth Park right now. It's hard to walk in the park without tripping over one. 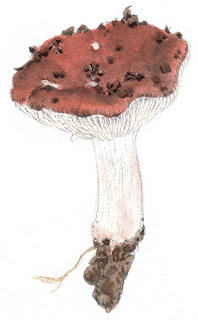 It's name is Russula brevipes. What you see is pretty much what you get. Today I walked in the afternoon, rather than my usual time in the early morning, because it's been too cold to draw in the mornings! By the time I got to the park the sun was going down instead of coming up affording me the opportunity to see things that are usually hiding in the shadows when I walk. 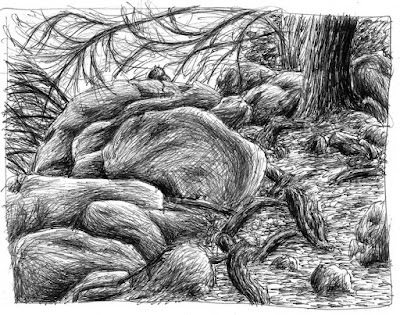 These rocks are so big and dramatic that I had, of course, noticed them before, but this was the first time they were lit by the sun, so I parked myself and drew them. Perhaps I should temporarily change the name of my blog to "Mushroom A Day". Despite the fact that we've had a ridiculously small amount of rain this fall, mushrooms are everywhere at Howarth Park. Which means they're plentiful in my refrigerator. There's still a little space for food, but it's shrinking fast. 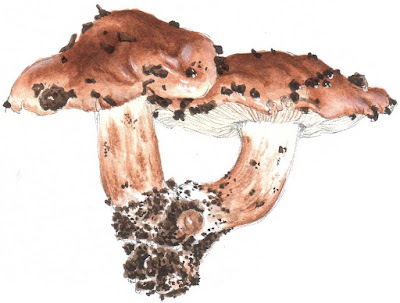 I'm going to try to paint at least one mushroom every day. I see this as an opportunity to really work with the watercolors and try to get myself to stop being so afraid of those silly little pans of color! Today's mushroom is Cortinarius glaucopus, identified by it's association with oak trees and the gently bulbous base (as opposed to abruptly bulbous). 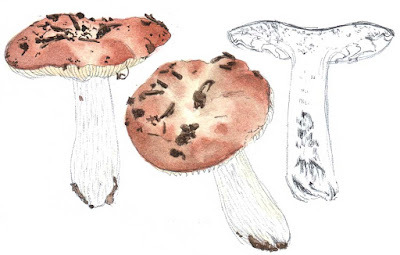 Corts, as they're fondly referred to, are among the most beautiful mushrooms. They're also quite variable in appearance. This one probably had a lavender cap when fresh. There were still a few hints of it when I found it. If I'd found it later, the cap would've been cinnamon brown. 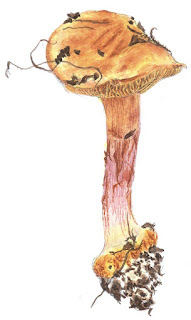 Cortinarius are named for the cobweb-like veil or cortina that turns brown as the spores are released from the gills. On the left side you can see where I held the stem and crushed the cortina. In northern California corts like to hang out with oaks. They're perfectly happy to never see the light of day and I've been developing the ability to recognize the bumps in leaves and debris that signal a mushroom. This plain little mushroom caught my eye because it was pink and unfamiliar to me. I found it at the edge of a meadow with several others of it's kind. My backpack was already crammed with mushrooms in (unused) dog waste bags but I couldn't stop myself. 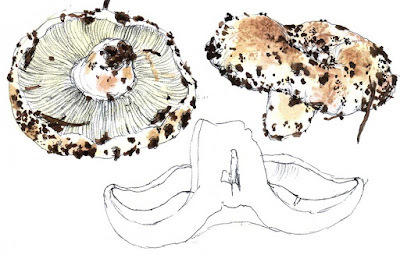 Do you suppose there's a group for mushroom-collecting addicts? Some clitocybes have interesting fragrances, so I was disappointed to find that this one just smelled like mushrooms at the grocery store. I did find out that it's not a good eating mushroom. According to Introduction to Mushrooms: "it produces a violent poisoning due to the presence of muscarine. In addition to vomiting and diarrhea and sharp abdominal pains, the victim will experience profuse sweating, uncontrolled salivation and tear formation. Their pupils will shrink so that the victim thinks they are going blind." Well, gosh, doesn't that sound like fun?